Update: This class is the first segment of Selling Your Screenplay Select Gold, a one year intensive screenwriting workshop where I will be walking screenwriters through the entire screenwriting process, from choosing a marketable concept to writing a professional screenplay, to selling their script. Space is very limited. If you make sure that your concept is marketable before you write your screenplay, you can save yourself countless months writing a screenplay that will never see the light of day. Don’t make this mistake! Don’t waste your time writing a screenplay that’s not built on a solid foundation with a marketable concept. Why a marketable concept is so important. What makes a concept marketable (it doesn’t have to be “high concept”). How to come up with marketable concepts of your own. How to make your already written screenplay more marketable by tweaking the concept and pitching it correctly. How to find smaller film markets that are hungry for specific types of films and are eager to work with new writers. I will be examining numerous recent films and their concepts to help you understand exactly how the concept plays into a film’s success or failure. I will be sharing my “concept template” with you so you can create your own marketable concepts. I will give you several exercises that can help you hone your ability to come up with marketable concepts. You’ve written a screenplay or multiple screenplays but have failed to connect with a producer who would like to produce your film. Or you’re about to begin writing a new screenplay. Or you want to work through the entire screenwriting process with a professional screenwriter and end up with a solid, marketable, professional level script that you can actually sell. This online class will be the first in a series that I will be running to help guide writers through the entire process of writing a marketable screenplay that can be sold. The next few online courses will be about outlining your screenplay before you start writing and the actual writing process. 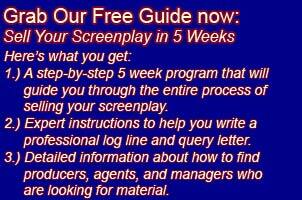 But you don’t want to start outlining your screenplay or start writing it until you have a marketable concept! By taking this series of online classes, you should have a marketable screenplay by the end of it that’s ready to be sent out to agents, managers and producers. The class took place on Saturday September 27th at 10am PST. The class was recorded so you can take the class anytime by joining Selling Your Screenplay Select. You can see all the SYS classes that are in the library by going here: SYS Online Classes.